The RS 5 TDI concept technology study is powered by an enhanced-output V6 3.0 TDI biturbo boosted by an electrically driven turbocharger. 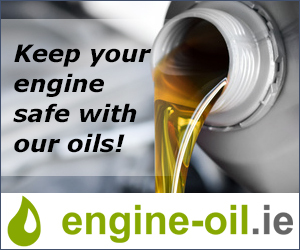 This new development makes the diesel engine sportier and more efficient. 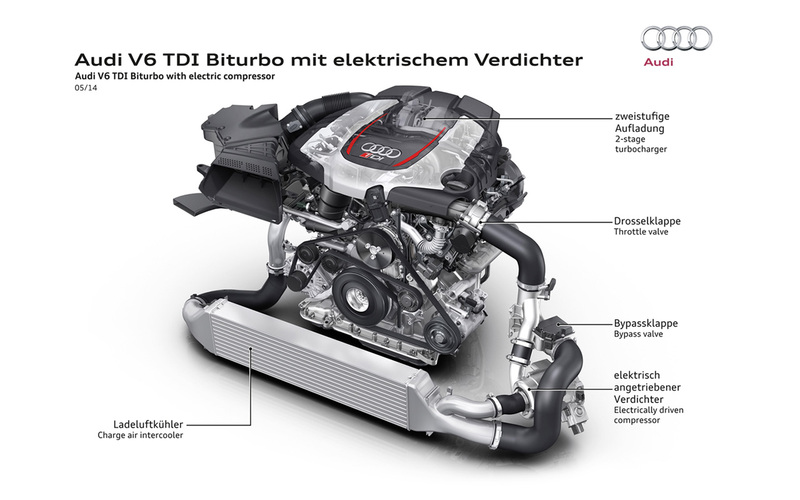 The V6 biturbo in the Audi RS 5 TDI concept produces 283 kW (385 hp); from 1,250 to 2,000 rpm it transfers 750 Nm (553.2 lb-ft) of torque to the crankshaft. The red-line is at 5,500 rpm. The supplemental electric turbocharger provides for staggering power when starting off. An electric motor replaces the turbine wheel and accelerates the compressor wheel to over 70,000 rpm in a few hundredths of a second. The exhaust turbochargers also provide as much as 2.4 bar of relative boost pressure. 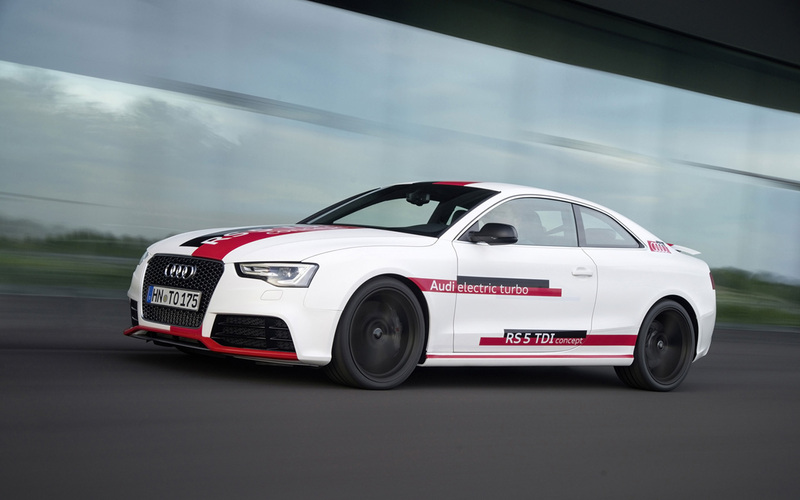 This combination enables the Audi RS 5 TDI concept to sprint from 0 to 100 km/h (62.1 mph) in just four seconds. The 200 km/h (124.3 mph) mark is reached in less than 16 seconds, and top speed is 280 km/h (174.0 mph). The average fuel consumption of less than 5.3 liters of diesel per 100 kilometers (less than 140 grams CO2 per kilometer) (44.4 US mpg/225.3 g/mi) documents the outstanding efficiency. Recuperation is the primary source of the drive energy for the electric turbocharger. 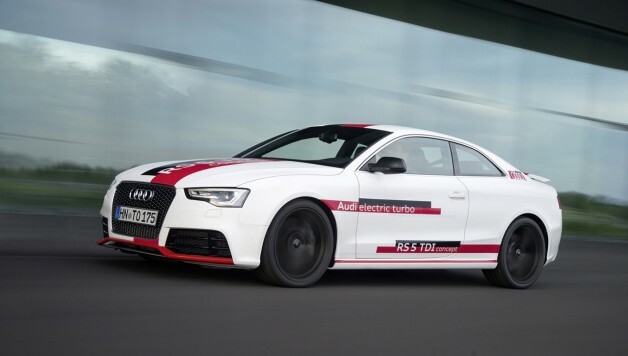 To transmit this energy, the RS 5 TDI concept uses a separate 48-volt electrical system that is connected to the conventional 12-volt electrical system via a DC/DC converter. The energy is stored in a compact lithium-ion battery. The advantage of 48-volt electrical systems is that they enable the transmission of larger amounts of energy. This makes them an important milestone in the Audi electrification strategy.